Asking for course credit for access/yield work. “The major concern of the meeting was restructuring the Board of Lumumba-Zapata College to include five student representatives -- 1 Black, 1 Chicano, 1 Asian American, 1 Native American, and 1 White-- 2 faculty members, 1 T.A., 1 staff person and the Provost.” - the vote didn’t pass and 100 students walked out, they also tried voting for 2 Chicanos and 2 Black students, but it didn’t pass. Are they an advisory board or are they the decision makers? McGill refuses to budge on power relations within the college, won’t give student control. Forces them to move to discussions about curricula, in hopes the students will forget about their other demands. “Should items 1 through 3 fail to produce significant increases in minority student enrollment, the Third College is prepared to reexamine its admissions policy and seek new avenues of redress; e.g. An increase in the 4% quota. McGill seems genuinely willing to create a majority Black/Brown college. 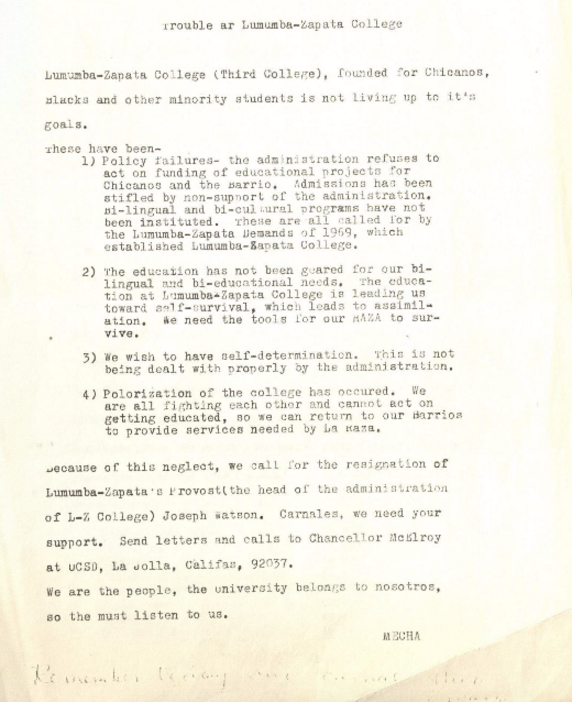 McGill agreed to some demands, as did faculty. LZM returned the original demands to him, ignoring his MANY edits.